Nicholas Michaelovich was the eldest son of Grand Duke Michael Nicholaievich, son of Emperor Nicholas I. He was born April 26, 1859 at Tsarskoe Selo, but spent his childhood in Tiflis, Georgia where his father was Viceroy of the Caucusus. After attending school in Tiflis, he commanded a batallion of the Caucasian Archers in 1877, and fought along side them in the Russian-Turkish war. When his father was named as President of the Council of the Empire and returned to Petersburg, Nicholas followed him. He was then named to Marie Feodrovna's Horse Guards Regiment. Nicholas loved education, and begged his father to allow him to enter the University, however Grand Duke Michael Nicholaievich was firmly opposed. In order to please his father, he then he entered the Acadamy of the General Staff (War College) where he excelled in his studies. Military life was not for him, though, as he much preferred studying butterflies and historical research. In his youth, he was very occupied with botany and had amassed a highly regarded collection of rare butterflies which he gave to the Academy of Sciences, and at this same time, he published a ten-volume work entitled "Discussions on the Lepidopterae". Soon, though, he began to be more interested in his historical research; publishing his first book "The Princes Dolgoruki, Collaborators to Emperor Alexander I" in 1890. In 1905, he left the military and pursued his research interests full time. Nicholas II happily granted him unlimited access to the Romanov Family Archives and Library. He soon published multi-volume works (over fifteen volumes in all), in both Russian and French, on the reign of Tsar Alexander I. This important work brought him international recognition as an historian, across Europe and even in the US. He even investigated the question of whether Alexander I was really the later mysterious "staryetz" Feodor Kouzmitch, While he never wrote about his belief one way or the other, those closest to him reported that he felt it was "plausible" but not very probable that Alexander I was indeed Kouzmich as some claimed. The Grand Duke was a member of the Acadamy of France, Honorary Doctor of History and Philosophy from the University of Berlin, and Honorary Doctor of History from the University of Moscow, President of the Imperial Russian History Society and the Russian Geographic Society. He was tall at 6' 3", and a beefy, bald, bear of a man. Nicholas Michaelovich fell deeply in love with his first cousin, Victoria of Baden. Any thought of marriage though would not be permitted by the Russian Orthodox Church which prohibited first cousins to marry. He loved children, and, while he never married, is said to have fathered several illegitimate children. "Uncle Bimbo" could be moody and eccentric, but also had a sharp wit and a keen, sometimes childish, sense of humor. He loved pranks and jokes, which endeared him to the entire family. He also considered himself to be a social and political liberal, even calling himself a "socialist". This behavior, along with his stubborn insisting on always speaking his mind, did NOT endear him to the Imperial family, and it was his charm and humor which often alleviated their anger toward his beliefs. This label of "liberal" was only further supported by his open and easy nature. He considered the men in his regiment to always be his equal, and addressed them as "my friends". He was uneasy at what would now be called "class pretensions" and especially the idea of being "above" the men, yet his men loved him deeply and praised him loudly. He would receive intellectuals from across the political spectrum and have long engaging discussions and correspondence with them. It was said that Alexander III once had him arrested for driving past the Anitchkov Palace in a humble "isovtchick" carriage drawn by one scrawny nag, his coat flapping and fat cigar in his teeth; his favorite way to travel in town. He loved to gamble, and spent much time in the casinos of Monte Carlo. (This was the reason he was the only one of the siblings at his father's deathbed in Cannes in 1909). Such "conduct unbecoming" a Grand Duke was his trademark. His nature could turn caustic as well. The Imperial family always said he had a mean and critical tongue. He loathed Maria Pavlova and all of the "Vladimirovichi" with the exception of Grand Duke Boris Vladimirovich. He would publicly and loudly assert his firm opinion that the Vladimirs had no rights to the throne. 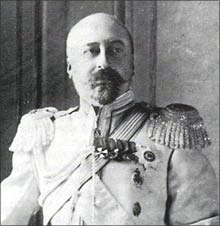 After the outbreak of the First World War, the anti-war Nicholas Michaelovich would make long diatribes in his favorite Petrograd clubs loudly against the war and highly critical of the Commander of the Army, his cousin Nicholas Nicholaievich. He became horrified by the actions of the Government at this time, and publicly lambasted their actions. So much so, that by the end of 1916, Nicholas II had finally lost his usual patience with Uncle Bimbo and ordered him out of Petrograd. Nicholas Michaelovich returned to the capital a few months later, shortly after the Tsar abdicated, and stayed there. The Bolsheviks exiled him in 1918 to Vologda, along with his brother Grand Duke George Michaelovich and Grand Duke Dmitri Constantinovich. The three were later brought back to Petrograd and imprisoned. On January 30, 1919 they were shot in the Peter and Paul Fortress.